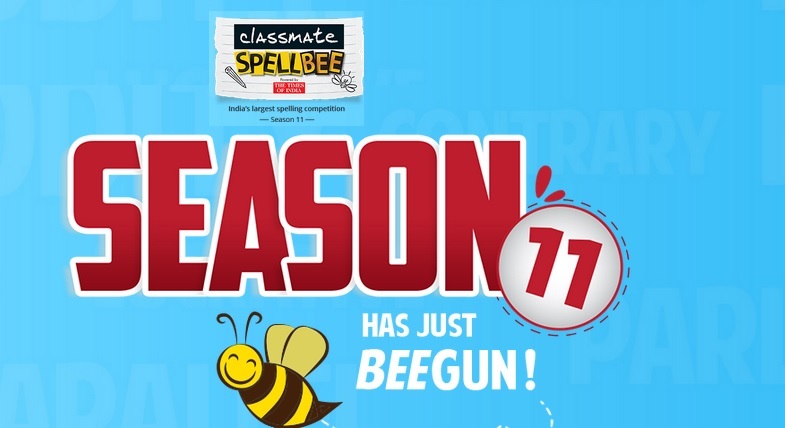 ENIL is conducting a competition titled as Classmate Spell Bee Season 11. Season 11 is bigger and better! So, prep yourself, and bee a part of it this year and win some awesome prizes! This Contest is open only for students of Indian nationality studying in Indian schools, from standards 5 to standard 9 within the age group of 10-16 years. Fill in the complete registration form as available at www.classmatespellbee.in (hereinafter referred to as “Website”). The registration should be done by Parents/ Guardians of the Participant. Standards V – IX, start gearing up! This Multiple-Choice Question (MCQ) format will test your basic spelling skills. You have to choose the correct spellings of 75 words from the options. Top scorers from each school move to Level 2 (City Finals) of the competition. You are also required to mandatorily fill in your information in a form that’ll be used for all future correspondence. You can now take the test online, provided you fall within the eligibility criteria. Participants who aren’t from the 30 cities that the competition travels to physically can participate through the online test. If your city does not appear in the drop-down, kindly select the city closest to where you reside. Top scorers from the online test also advance to Level 2. The short-listed students will be intimated via the school co-ordinator or through phone. In each city, all the winners from all schools will compete together in an online test to be held on pre-decided dates, on www.classmatespellbee.in. The date and time for the test will be communicated to the students in advance. The highest scorers from Level 2 make it to Level 3. ** This is a time-bound online MCQ test of 75 words lasting 7.5 minutes. ** The test will be live for all students who qualify for Level 2 on pre-decided dates (to be finalised). ** Click on the Competition tab and then go to ‘Participate’ and choose Level 2 to access the login page. ** After reading the instructions on the login page type out your username, password, mobile number and email id in the fields and click on the ‘Take the Test’ button to access the test. ** Providing your mobile number and email id is optional. ** All participants will have to take the test on the dates mentioned above. Dates will not be revised or extended once they are declared. ** The test has to be taken only by the selected participants. In case of any dispute, the organiser reserves the right to disqualify the participant. ** The participants will be responsible for making all arrangements to take the test online, which includes the computer, constant internet connection, power back up etc. ** The organisers are not responsible for any technical failure from the participant’s end. If the test results in a tie, in-built tiebreaker questions will decide the winners. In case a tie exists even after a tiebreaker, a randomizer will be used to choose the winner. Level 3 is organized on a specific date and place that will be communicated to the shortlisted participants in advance. An online MCQ time-bound test for 10 minutes with 60 words. The top 10 scorers from this round progress to Round 2 of the Semi Finals. An online MCQ time-bound test for 10 minutes with 40 words. Students with the Top 16 scores across the country from this round qualify for Level 4 – National Finals. Top 16 qualified students are divided into groups of four each. Each group participates in one out of four semi-finals. Winners from each of the four semi-finals compete in the Grand Finale. Winner of the Grand Finale will be declared the National Champion of Classmate Spell Bee 2019. Please let me know the result of Classmate Spellbee, 2019, which took place in business plaza. You people were about to inform on March 18,2019 irrespective of the fact whether the contestant has been selected or not. But you have failed to keep your commitment. Please show my result. My ID is SB11_004289. I want to view my semi final result. Show my daughter result. Her roll number is SB11-212799. I have not got the result of level 3. My User ID is SB11-033601. I have not got the results of level 3. I want to know the result. Where is the result? PLEASE SHOW MY RESULT. MY ROLL NUMBER IS SB-11541972. My Special ID is SB11-167223. Please show me my level 2 result. Please send my spellbee result. My ID is SB11-233696. Tell me my results and also I want to know that whether I have selected for level 3 (or) not. My unique code is SB-11-039328. Please send my result. MY ID IS SB11-32594. PLEASE SHOW ME MY RESULT. Please, can we still register for 2019 Spell Bee contest. My unique ID is SB11144530, please show my result. Please send me my result. My unique code is Sb11-254629. My daughter’s user ID is SB11-125240. Please show me the result. My daughter’s user ID is SB11-256342. Please show me the result. MY UID IS SB11-039561. PLEASE SHOW MY RESULT. MY DAUGHTER NAME IS NIDHARSHANA. HER UID NUMBER IS SB11140583. HOW CAN I KNOW MY DAUGHTER’S RESULT? PLEASE SEND MY SPELLBEE RESULT. MY ID IS SB11075171. My son had given the spell bee and I want to know, when will the results be out. My son’s ID is SB11-541676. Clarify that, Is there any participation fee for Classmate Spell Bee season 11? I am also participated in it. Please tell me the date of result. I want to know my result. Let us know, when the results are going to be announced? Please show my result. My ID is SB11-239579. I want to know, is it a online/offline exam? My UID is sb11_234298. Please show my result.